A "quaint little fishing village" with far more tourists than fishermen, Menemsha is worth a visit for its beach, for views of its little harbor, and for a seafood picnic lunch. Turn right off South Road in Chilmark at Beetlebung Corner; the harbor is a mile or so down the way. 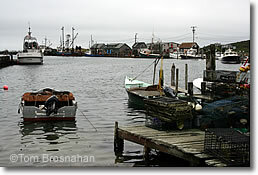 In Menemsha Harbor there isn't exactly anything "to do" except stroll and loll away a couple hours. The first thing that struck me about Menemsha is that it really does look like a small old-time fishing village: well-used, weather-tested fishing boats are tethered to its short wharves, and small knots of no-nonsense workers in big rubber boots gather at the cafes, the fuel pumps and the Coast Guard station. The next thing that struck me was the signs, hundreds of them, telling me not to do things. Most were about parking, but others included where not to eat food, where not to dispose of trash, where not to walk or sit. Can't blame the Menemshans for wanting to preserve the quaint charm of their tiny village in the midst of a tsunami of summer visitors, but as a casual visitor one feels a bit constrained. 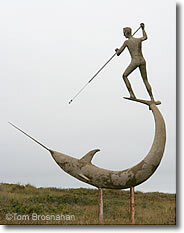 Whaler Statue, Menemsha, Martha's Vineyard MA. If you saw the movie Jaws, you may recognize Menemsha, its prime setting. What everyone wants you to do—and what's worth doing in Menemsha—is to buy an ice cream cone, a lobster roll or a cup of clam chowder at one of the tiny fish markets, sit outside on an old wooden crate and eat it, take a few photos and, if you've got towel and bathing suit, go to the fine beach for a swim. And, oh yes, come by VTA bus (so you don't have to park a car), don't dispose of any trash, and watch where you sit. Of course, if you have a summer rental cottage right in Menemsha, you'll have fewer worries. You'll probably want to combine your Menemsha excursion with a visit to the colored clay cliffs of Aquinnah (Gay Head), nearby.